Growing up waffles came out of boxes, not waffle makers, so you can imagine how excited I was when I discovered that Mike had a waffle maker. Soon I was pumping out all sorts of waffles: liege, chocolate, blueberry. I even made waffles to go with fried chicken for a Southern treat. Waffles with savouries are not exactly a revelation for me and I think waffles go great with sausages or bacon. But it never occurred to me to put meat inside the waffle. 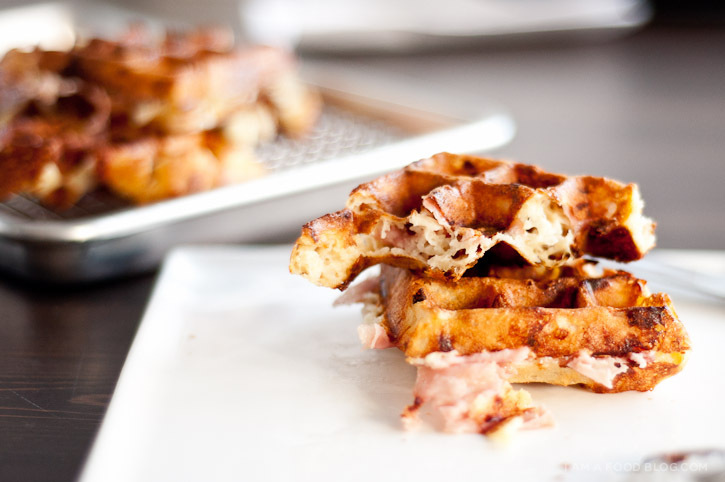 You have got to try these golden brown waffles oozing with cheese and studded with ham. 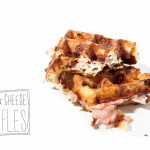 The waffle is light and crisp and the added gooey-ness makes it over the top delicious! This recipe may seem a bit finicky with the extra step of separating the eggs and beating the whites into a soft meringue, but I find that it lends a light and airiness to waffles that wouldn’t be had otherwise. I am a sandwich, I am a waffle: I AM HAM AND CHEESE WAFFLE! Preheat oven to 300°F. Heat your waffle iron to very hot while preparing the batter. Separate the egg white and yolk. In a bowl, using a mixer or whisk, beat the white until medium-soft peaks form. 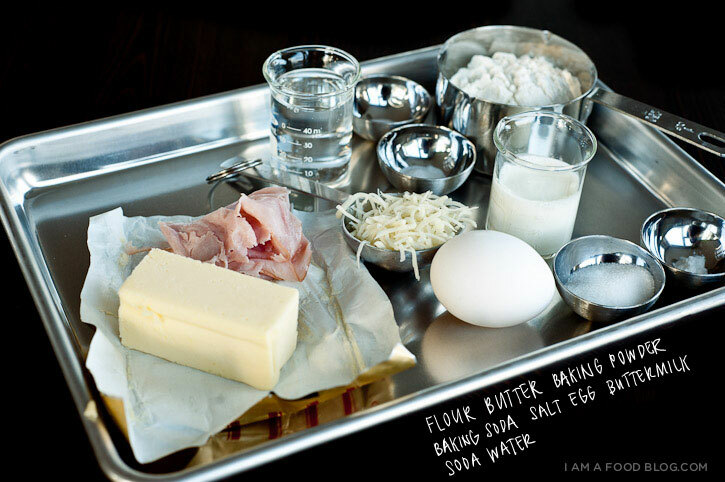 In another bowl, whisk the egg yolk, melted butter, buttermilk and soda. Gradually whisk in the dry ingredients and fold in the egg whites. Gently fold in the ham and cheddar. Cook in your waffle maker until golden brown and cooked through. Transfer to a baking sheet and keep warm in the oven between waffles. Serve warm with butter and syrup, or enjoy plain. The recipe was from Bon Appetit. Ham and cheese cooked into an omelet? Now that sounds delicious! 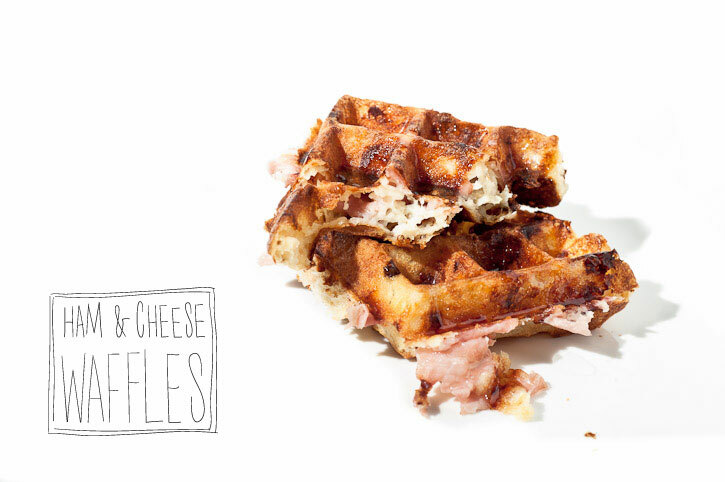 I normally add cheese and pieces of bacon to my pancakes… but now I want to buy a waffle iron and make these! “wish the egg hold” ????? I love this receipe ! What a great idea for waffles. I also tried this receipe with bacon and steak . YUMMY !!! !